Sunday, July 22nd, as the clock inched closer to eleven, we pulled back into our driveway in the darkness. My sister Caitlin, my sister Faith, and I had just traveled nearly ten hours back home from St. Louis, back home from Realm Makers. The last hour of the drive, I finally realized that I was, in fact, exhausted. That need for rest expressed itself in shivers and a feeling of frigidity that denied the warmth of the summer night. In the previous fourteen days, I had changed my social media branding entirely from one name to another. I finally checked off the last piece of writing advice that you’re told so very often: attend a conference. I had met friends who mean the world to me, in spite of their distance from my house, and met an author who was (and still is) one of the most influential people in my writing journey. 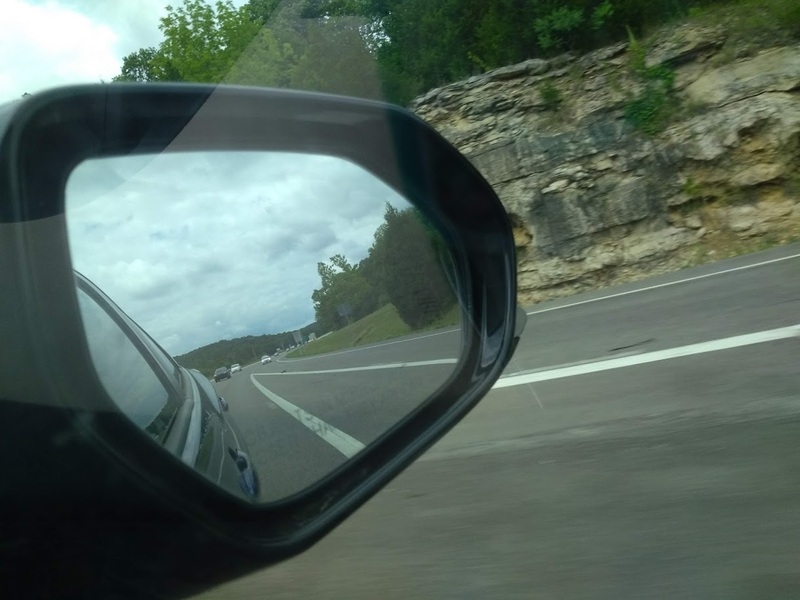 I traveled farther than ever before; drove farther than ever before; juggled before an audience for the first time (it was the aforementioned friends, but it counts!). I learned I would be published for the first time. And the time finally came for me to address the questions that had been circulating quietly in my head for the last year and a half. For as long as I’ve been looking for writing advice, I’ve seen the same pieces given over and over again: show don’t tell. Keep reading. Keep writing – just finish the novel! Go to a writers conference. For years it was implausible at best, though every year I knew people who were going to conferences. 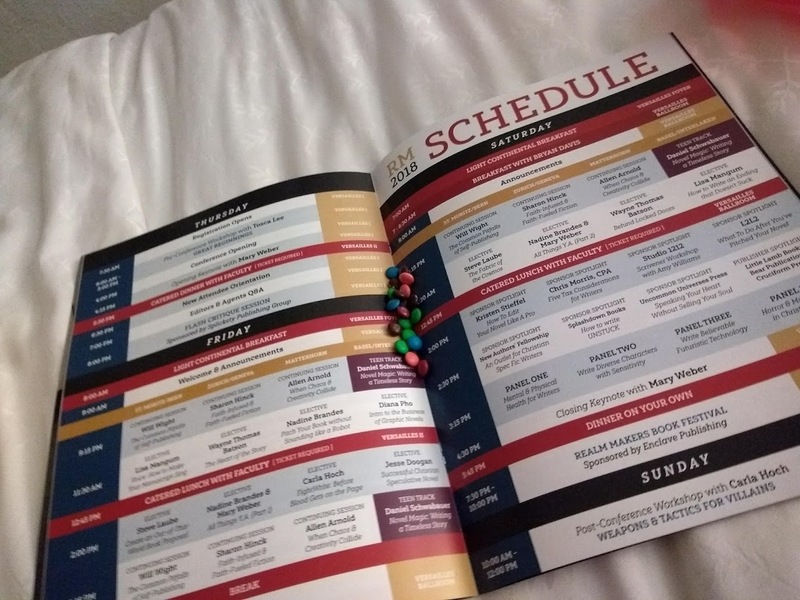 First, the Florida Christian Writers Conference; then Realm Makers, a bizarre little niche market conference which was exactly what I wrote. Last year at the end of July, I applied for a job at a local Chick-fil-A, because next time Realm Makers came around, I was going to be there. 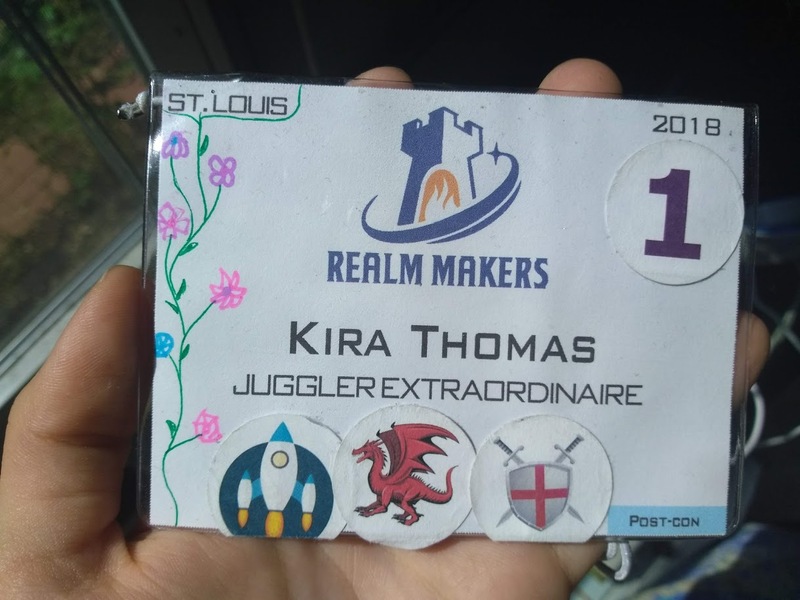 When I registered for Realm Makers, I waffled back and forth over whether to use my real name, or the name by which I’m known: Athelas Hale. 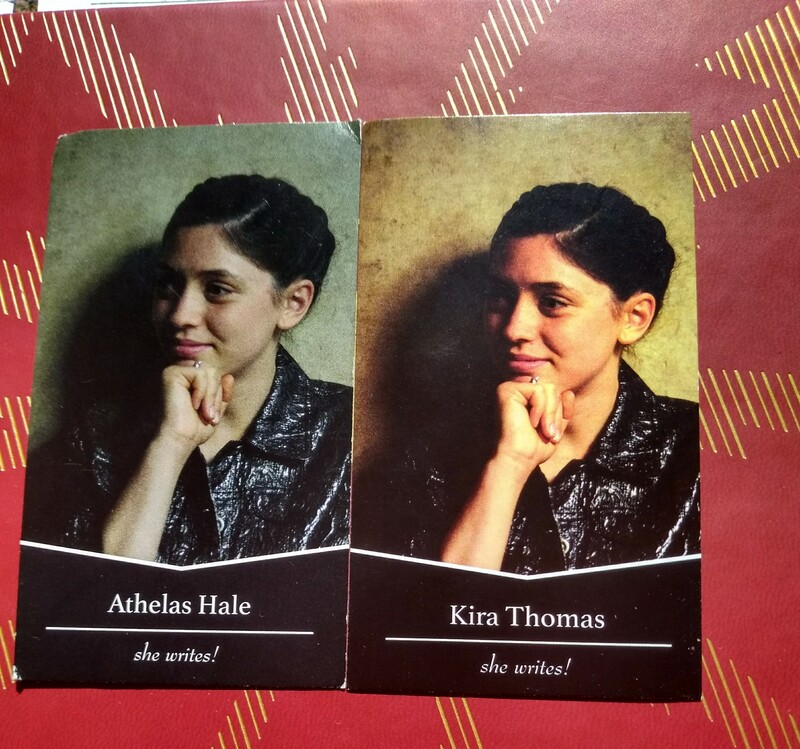 I’ve been using Athelas since 2011: it’s been a part of my writing identity since the day I began to write publicly, and all of my connections have been made under that pseudonym. To go to Realm Makers, a professional writing setting, would be to set that name in stone. Though it could be changed at a later date, it would be more easier to do it earlier, rather than later. I decided to stick with it. I set it to be the display name on my name-tag and ordered business cards. They arrived with time to spare. All was well. I had become so comfortable with it as a name that I never thought to look it up. 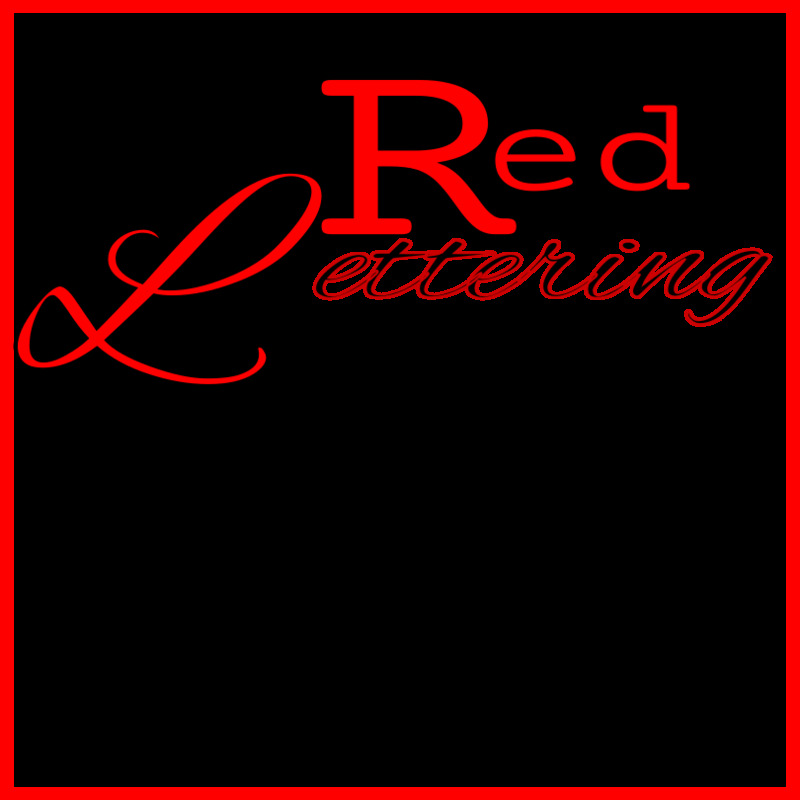 July 12th, less than a week before the day we would leave, I scrambled to order new business cards because, as it turned out, it was time for me to switch over to my real name. The Tolkien Estate had made the decision for me. Re-ordering also allowed me to fix some color issues that appeared during printing. Hi. I’m Kira Thomas. It’s nice to meet you. Remarkably, my new business cards arrived on time. Vistaprint, y’all – A+ printing and shipping time. Six o’ clock Wednesday morning rolled around, and we pulled out, raindrops collecting on our windshields, our hearts full of anticipation and nerves. “Juggler Extraordinaire,” my name tag read. Because, first of all, this is a spec fic writers conference – did they really expect anyone to put a simple “writer” or “editor” in the title section? Anyone there could safely assume that I’m a writer, and juggling is without question one of my more interesting and extraordinary skills. Eventually, it led back to that old familiar question: am I supposed to be writing at all? When I put my information into the Realm Makers registration page, I was no longer comfortable calling myself a writer. Was I at Realm Makers to learn the craft, to meet new people, to see old friends? Yeah. I was also there to find an answer to this question. Soon after we got our schedules, I circled all of the classes I would be taking. The M&Ms were just there for decoration. Thursday evening, we sat in on the Flash Critique Session. Weeks earlier, I had submitted a 300-word short story as part of the competition. Each of the ten submitted stories were read aloud by Scott Minor (except the first, which was read by a plucky volunteer because no one could find Scott), and then a panel of judges gave their critiques, both the good and the bad. Seven stories were read and critiqued. I agreed with some of the critiques; I disagreed with some. I recognized the names of many of the authors, and appreciated many of their stories in various ways. Eight stories were read, and I began to wonder if they were going to read mine. Was it not chosen as one of the ten? Did they hate it? Did it stray too far from their theme? Nine stories were read. The night was growing late. I went to bed exhausted and happy that night, ready for the next day. I attended Sharon Hinck’s continuing session class: “Faith-Infused and Faith-Fueled Writing.” The first morning, she told us that she would share some of her personal story, but not yet. We are writers, and we know better than to dump a lot of backstory at the beginning. The backstory would come on Saturday, after her two sessions on Friday. She taught on what our reasons behind writing should be; how we ought to write; who we write for, and whether our writing matters (hint: it does). She spoke on tools of the trade, and how to effectively communicate a message without turning our novels into poorly-done sermons. For the first time, I heard an instructor tell us to double- and triple-check our theology when writing, because it’s never only fiction. When it was applicable, she told us miniature stories of her experience, and how other people have reacted to her books, until her foreshadowing and hints turned into a full-blown origin story during the last session. But the last session happened on Saturday, and we’re not there yet. Saturday morning dawned bright and early, and lead rapidly into one of the conference moments I was most anticipating: meeting Bryan Davis. I’ve told before how he’s influenced me as a writer, so I won’t add more words to this already wordy post to rehash that. Suffice to say, after ten years, I was ready to meet him in person. We walked in, and nearly strolled right past his table because we expected him to be somewhere else. Not my proudest moment. Introductions happened. We shook hands. I had nothing to say, so I awkwardly hovered around the table, and about twenty minutes later, everyone moved into another room to hear him speak. I’ve been following him for ten years, so I know nearly all the stories he tells when he speaks. So it was with this speech, but I listened because, even though I know all the stories, sometimes it’s good to hear them again. He spoke about his own writing journey, from the first book he tried to write, to the rejection notices, to his marketing efforts in the early days of his writing career. Then he told his Autarkeia story, and about some of the responses he’s received from his books. In his story, you can clearly see how God took care of Mr. Davis when he followed the call to write. And he talked about how speculative fiction matters. Soon after he left was the final session of Sharon Hinck’s class, where her origin story unfolded. She told us the story of how God called her to write to begin with, how God called her to write after medical issues got in the way, and how God is using her now. “Good theology includes you being valuable, even when you don’t produce,” she told us. You are building on the foundation of the authors who have come before you, she said, and directed us to think of the most influential books in our lives. The ones that teach us things; the ones that change our direction, or solidify a truth that we needed to know. Even though I was listening to her story, my notes from that session don’t cover what she spoke on. Instead, they ramble about what I already knew: that stories are valuable, and speculative fiction can and has changed lives. I’ve known it for so long, and been so familiar with the stories of the authors who have experienced miracles and promptings, that I’ve begun to take it for granted. Your calling is to love God, love your family, and love others. Sometimes the two intersect, but you weren’t made to write stories and die. You were made to love people – and if you love people through the writing of your stories, that’s okay, too. And then she reminded us that our heritage, created in the image of a Creative God, born again as His adopted children, is to be unstoppable creators. The conclusion from the critique session came in: guys, I’m going to be published in Havok, January of 2019. And the conference proper ended that night, with only the post-conference workshop to follow. 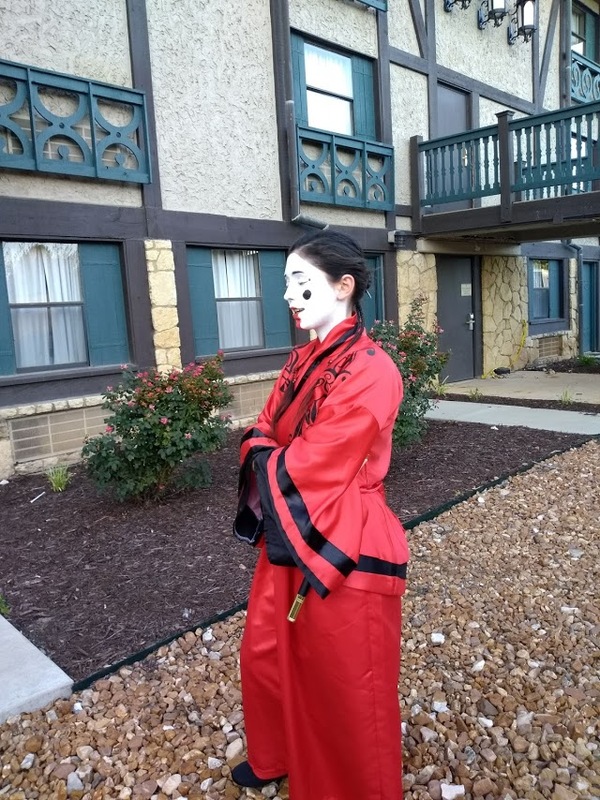 My cosplay was Masayi Sairu, from Anne Elisabeth Stengl’s “Golden Daughter“. To provide a dramatic pause for the continuing narrative, now is the time to insert everything else that happened in the conference before we get around to The Answer. We walked into the hotel, checked in, and began to look for the stairs to find our room. Before we were a minute into our search, familiar faces came around the corner, and we all but ran into some of my favorite people, headed by the fabulous Katie Grace. There was squealing. There was hugging. There was sentiment. Then we had to hurry to find our rooms. The conference was full of faces that are dear to me. My Camp Cabin and my people: Jessi Roberts, Jaye L. Knight, Kara Swanson, Jeneca Zody, Stephanie Warner, Rosalie Valentine, Tricia Mingerink, Savannah Grace, Ashley Townsend. There were some people who I’ve been acquainted with for years, and even a reader of this blog (it was fantastic to see you! I know we only said a few words to each other, but I’m glad you were there!). I met new people, and accidentally ran into people I’ve followed on Pinterest for years (Meaghan Ward, and Elizabeth Lewis). I met and discussed story ideas with Captain America during the costume banquet (I kid you not: when my sister and I went to stand in line for desert, we found Captain America… at the end of the line). Upon seeing some promo material for this book, I tried to track down the author all day. We finally ran into each other, and I found myself the happy owner of a new book to take home to my little sisters. We discussed aspects of salvation with a friend, and I’m scheduled to duel Lisa Mangum any time now because she hates the ending of the Lord of the Rings. Carla Hoch’s classes were exactly as fantastic as I expected them to be. I came home from Sharon Hinck’s class with a whole list of all the obstacles we as a class could come up with, and at least three possible solutions for every one of them. I realized how exhausted I was when, the day after we got home, I started sobbing over something definitely not-sob-worthy, and for the next week, I was tired and cold on most days. I’m still tired. I came home with my question still swirling in my head, and fully prepared for it to swirl for a good long while. But I also came home with the assurance of something I had known so well, I had all but forgotten: there is value in stories, and – more importantly – God Himself places value in the stories that His people tell. That assurance makes me feel a whole lot better. For years, I’ve been of the belief that God calls us to act in love and to serve him wherever we go, however it seems reasonable to us, as we are educated by the Bible. We’ll probably make mistakes and errors in judgement, but in the end, God has this all worked out. We don’t see a lot of prayer and fasting before action with the disciples: we see them say, “God said to preach the word, how about we head twenty miles south to that town over yonder?” They lived what they knew of God’s character. Maybe God didn’t call me to be a writer. The question will probably stick around for a good long while. Maybe I don’t have to be called to be an author… to be a person who writes. But for now, I’ve made the decision that I’m going to operate as though He has, under the knowledge that it is good to create stories that give hope to people and glorify his name. When He’s ready for me to stop, He’ll let me know. 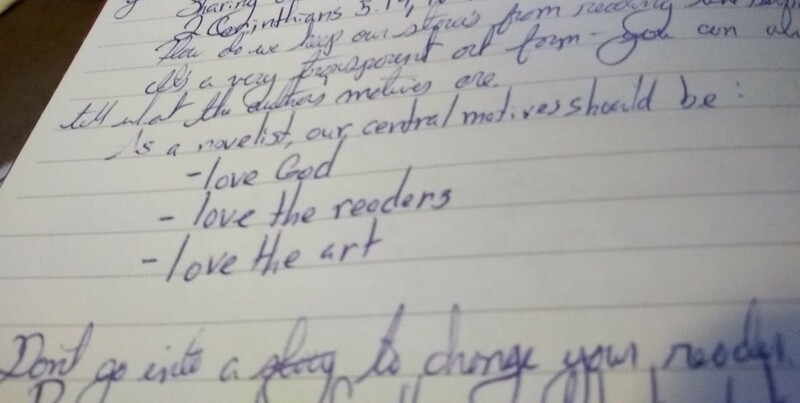 For whatever reason, the first year that we were able to make it, the theme of the conference was this: love God, love people, and be honest in your writing. For whatever reason, what I gained from this conference was not new information. It was a constant, steady call to remember what I’ve learned in the past– to call to my attention the personal stories where God has taken writers, picked them up from whatever they were doing before and told them to write. WHERE DOES THAT LEAVE THIS BLOG? I started this blog because, as a young girl, I was very confident in my abilities as a writer. I still am: I know how to identify good writing when I see it, so I can usually self-diagnose whether a piece is good or bad. But I started this blog to teach others what I know and, right now I feel all taught-out. I know both too much, and too little, to continue teaching. As of tonight, I don’t know what this blog is going to be. I guess we’ll see together, if you’re interested. I have eight semicolons in this blog post. You are absolutely right. I need to use them less. It was wonderful finally getting to meet you and your sisters! I wish there could have been time to chat more… perhaps next time! Ah, WordPress, why must you put the emoticon randomly in the middle of a sentence when I clearly placed it at the end? It was fantastic getting to meet you, as well! Next time, for sure. Thanks, Olivia. That means a lot to me. With all of the professionalism and sleek design of WordPress, somehow the emoticons still mess it up every time. Second, I think everyone at some point in their writing journey asks themselves if they’re even supposed to be a writer. I did. Still do sometimes. In the end, I came to the conclusion that I love telling stories. It’s what gets me excited, fills me with passion, and makes it so I can’t wait until morning when I can write again. I cannot not write. Whether you’re called to make writing your career or you choose to take a different path, God did give you a gift with words. If it brings you joy, don’t stop. It was lovely to meet you, too! Aw, thanks. A large part of why I wanted to keep my pen name was familiarity… and also internet anonymity. It’s an uncomfortable thought that my boss can now Google my name and potentially come up with some of the more disturbing writer-ly things that I’ve put on the internet. I think what I really needed was a sort of permission to value writing, which is what I got. For now, I’m good. We’ll see where the next six months or year leaves me. It seems part of being human is needing to relearn the same lessons over and over again. Awesome recap. Thanks for posting. It was good to meet you (on the steps of Fuzzy’s Tacos), and congratulations on winning the flash fiction contest. I liked the story. A lot of times we seem certain that God’s calling for us is a lot more specific than “Love God, love your family and love others,” but a lot of times He lets us choose the specifics of how we do that by following passions that He put in us. So write on! It would make life a whole lot easier if all of us were able to confidently say, “God specifically told me I need to be doing this job at this particular time.” But I guess that’s where free will comes in. Sometimes when I’m feeling doubtful about whether I need a specific calling to write, I remind myself, do construction workers need a specific call to work construction? Sometimes it helps. Thanks, Rosalie. ❤ It was so lovely to meet you at Realm Makers!